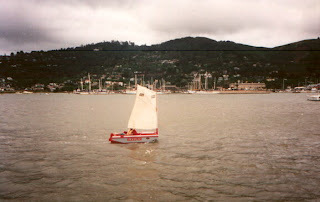 Yesterday I posted a list of web links for Trailer Sailers that I copied from my old Small Sailboats website. Today I’m publishing links for Pocket Cruisers from the same obsolete website. I define a Pocket Cruiser as a cruising sailboat between 16’ and 26’ LOA. Boats at the websites listed all happen to be monohulls. I have a separate list for multihulls. 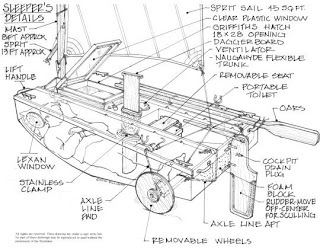 http://www.woodenboat.net.nz/Boats/BoatBluejacket/bluejacket1.html Gypsy Cutter - 24' Ganley Design. http://akzeigers.com/MJ.html Martha Jane - 'Selkie'. http://www.msogphotosite.com/m17strawanza.html Montgomery 17 - Solo Sailor. http://www.youtube.com/watch?v=5NgzvOX_5gA Swaggie Junk Sailing Video. Here is a list of useful Trailer Sailer web links taken from my old Small Sailboat website, which was last maintained in 2008. I have removed every defunct link; however if you find any that do not work, please let me know. You can make a comment to this effect by going to my latest posting and placing a comment there. http://www.proaxis.com/~boblark/bw2_main.htm. Birdwatcher 2, building project. http://www.conspic.demon.co.uk/ Cornish Shrimper - The Black Sheep. http://www.greatfallsboatworks.com/designs/coresound.html Coresound 17' Open Boat. http://www.marlinbree.com/events.htm Das Boot: The Boat. http://www.sredmond.com/elver.htm Elver - 20' Trailer Sailer. http://e460.blogspot.com/ Enigma 260 - variant of Matt Layden's Enigma. http://www.duckworksmagazine.com/06/projects/paradox/index.htm 'Enuf' - Derek Clark's Paradox. http://www.alistego.com/ Eun Mara - Alistego. http://www.mitchellyachts.co.uk/explorer/ Explorer - eco-friendly microyacht. http://maib1.freeservers.com/ Lee's Precision 165 Page. 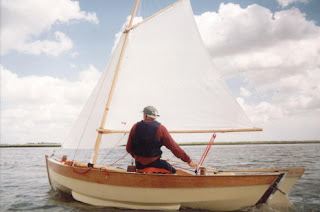 http://www.kolbsadventures.com/light_schooner_1.htm Light Schooner - Bolger. http://www.martin16.com/ Martin 16 - Lifting Keel Boat. http://physics.bgsu.edu/~layden/FunStuff/Boats/Matt_Boat/ Matt's 'New Swamp Thing'. http://www.ace.net.au/schooner/keyes.htm Micro - Roger Keyes's. http://gliksman.club.fr/pabouk/index.html Pabouk 260 and 360.
http://www.freewebs.com/paradoxbuild/ Paradox. - My Johanna. http://www.turtlecreek.net/genesis.htm Weekenders - Steel Away and Genesis. 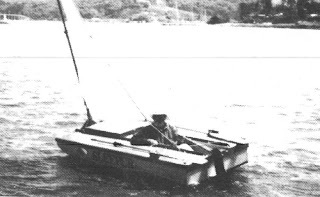 http://www.squirrelhaven.com/ld/ West White Potter 15 - Little Dipper ..
http://welker.atspace.com/index_files/Page338.htm West Wight Potter 19.
http://www.nutfarm.org/boat.html West Wight Potter 19 - "Necessity". http://potter-yachters.org/ West Wight Potter - Potter Yachters. Here is an article by the late Don Elliott. He gave me permission to publish it online, although he retained copyright. 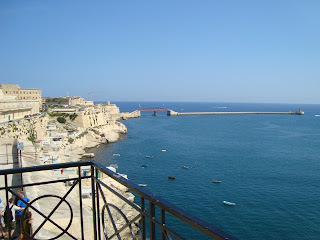 I am publishing it again, because I think it will be of interest to the readership of my blog. Please bear in mind that details of where plans for building ‘Sleeper’ may be out of date, as the original publication was in March, 2001. If you have ever lived aboard a boat you would know how important a good dinghy is. It has to transport you back and forth in all kinds of weather. It has to carry your food and laundry, and hopefully those items will make the trip without getting wet from rain or spray from choppy conditions. In other words, it has to do a great many things well. There are times you must take the dinghy with you on your car for various reasons, so the dinghy has to be easy transport. This sketch is of the ultimate dinghy. It's called Sleeper and was designed by Derek Van Loan. 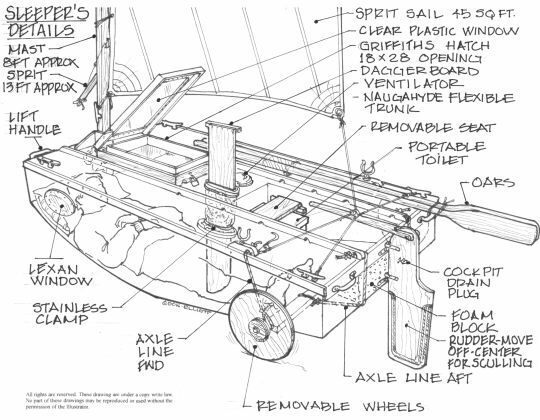 This second sketch shows details of the dinghy. The wheels are tied to the Sleeper for moving it around and removed when the dinghy is in use. As you can see this is quite a step up from your basic dinghy. The Maurice Griffith Hatch appears too small in the drawings. This photo of Sleeper gives a better view of the hatch. Sleeper is called the "Swiss Army Knife of Boats". It was given that name by Derek Van Loan. Derek lived aboard boats on the San Francisco Bay for 11 years and travelled over 8,000 miles in dinghies. 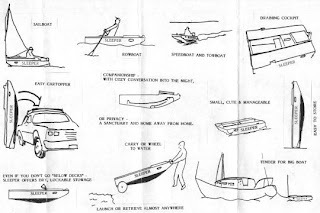 In the process of using dinghies daily he learned a great deal about what a dinghy needed to be. With that knowledge he designed and built Sleeper #1. This is what he has to say about Sleeper #1. 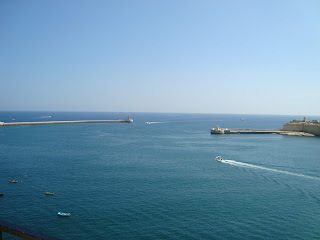 "Sleeper became my favorite day sailor and tender and I soon grew to appreciate the decks which keep out rain and spray. Before Sleeper I spent hours bailing open dinghies. Locked stowage for oars and other items was also handy. 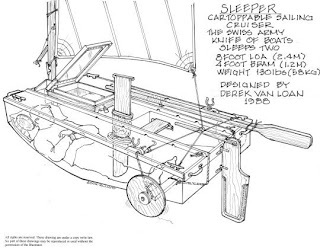 Sleeper also served as a stable platform for general use and proved excellent for anchor handling." The reason it's called sleeper is it has accommodation to sleep two in its "Cabin". Derek has actually used this boat to cruise the shores of San Francisco Bay using Sleeper as a camp cruiser. This is a photo of Derek's Sleeper, I'm not sure I'd pick this color scheme for myself however. San Francisco Bay can become very windy at times, with a lot of chop and any boat that sits as low in the water as Sleeper must have a good watertight hatch. The hatch used on Sleeper is called a Griffith hatch. An Englishman named Maurice Griffith designed it. This hatch keeps the water out in all but the very worst conditions and an unusual thing about it is it is not dependent on seal or gaskets; a simple hasp is all that's needed to keep green water out of Sleeper's interior. Also its design provides for ventilation by using the drain holes and top clearance of the coaming to allow air to enter the cabin while keeping the water out. 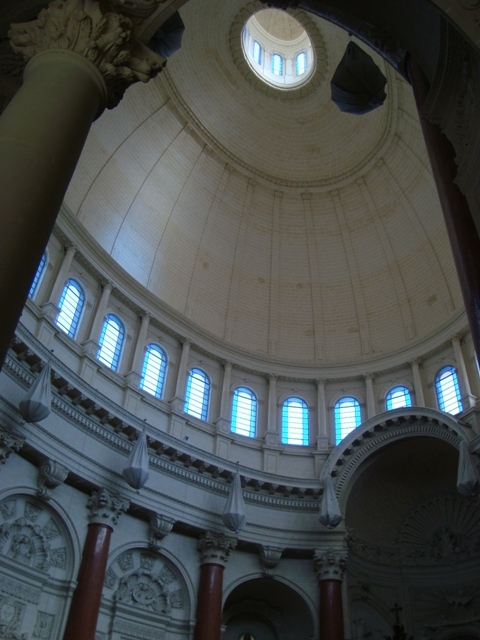 The Griffith hatch has a plastic window in its top surface so you can study the stars before to going to sleep. This is a brochure cover that I received from Derek Van Loan, who handles the sales of the plans for Sleeper. (His advertisement for Sleeper's plans appears in every issue MAIB. The plans come with four sheets of details and a set of building instruction). They may be obtained from Epoch Press, 186 Almonte Blvd, Mill Valley, Ca. 94941 (TFP), but the cost is $37.00 dollars; I guess that would be about £25.00. This page is under Copyright © to Don Elliott, all rights reserved, and the Webmaster has been granted permission by him for its publication according to agreements between the two parties. March 2001. Every time I pass along Cherry Orchard Way I look at a road sign that warns of pedestrians crossing the road. Why do I take particular note of this sign? Let me explain. For several years I’ve watched it; in fact from the time Tony Blair was Prime Minister. He backed George Bush, the President of the United States, into invading Iraq to overthrow Saddam Hussein. Poor intelligence lead to the belief that Iraq was on the brink of making an ‘H’ bomb; similarly it was believed that the Iraqi military had rockets capable of delivering an ‘H’ bomb to Israel, and even to the UK. We all know what happened. There was great loss of life by the Iraqis and the allied forces. Problems continue to this day. Investigations on behalf of the United Nations proved that no ‘H’ bomb or factory for making it ever existed. 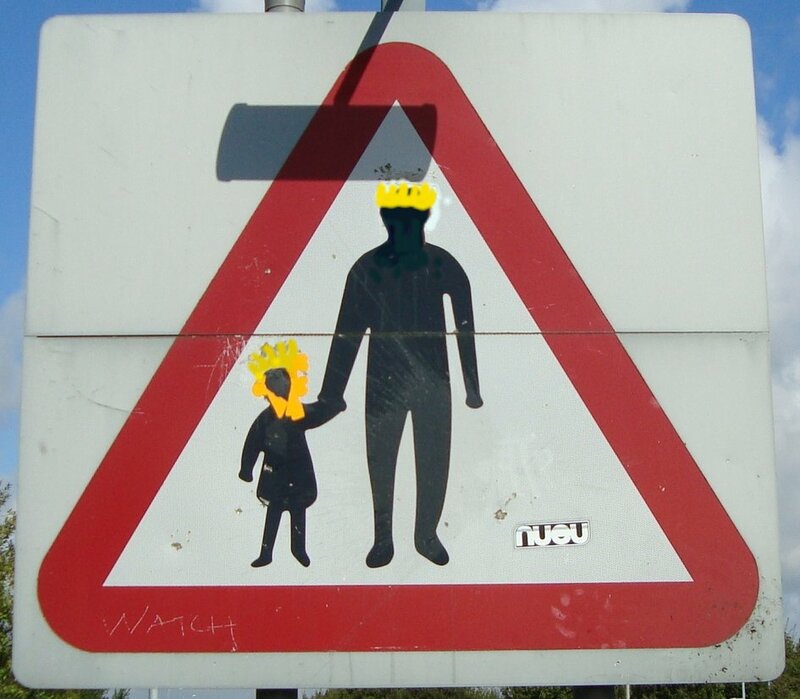 Well, during the Iraq war, this particular road sign was transformed by the addition of photographs of the faces of George Bush and Tony Blair; the father figure was Bush, and the child was Blair. This was sarcasm to the extreme, because at the time, there was a common saying that Blair was Bush’s poodle, implying that he did what Bush told him to do. Eventually, someone got around to removing the photos from the sign, but later it was defaced again, not by photos, but by orange paint. 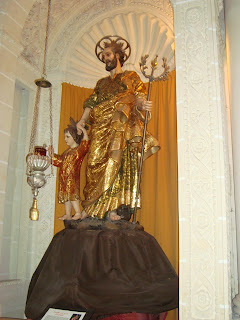 Orange crowns were painted on the heads of both figures; the child was also given a halo of fire around his face. I was perplexed as to what this could mean. What did the person or persons who defaced the sign want to communicate? I am still puzzled by it. Since then, there has been another development. The head of the father and his crown have been obliterated by brown paint, and the child’s crown has been scraped away. 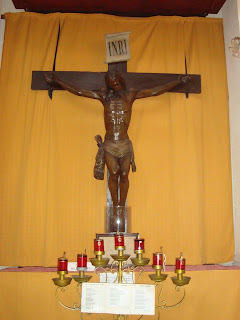 Could it be that whoever has done this does not like the symbolism? No doubt, as with the Bush and Blair embellishments, there is some political significance behind it, but who the figures represent I do not know. However, the sign made me think of the father/child relationship - a father and his son, or a father and his daughter. Here we have a symbol for a father who cares for his child. He is leading him or her across a road. He is showing the way, protecting and guiding. The child has complete trust in the father, and is totally reliant upon him. The child is happy to hold the hand of the father. 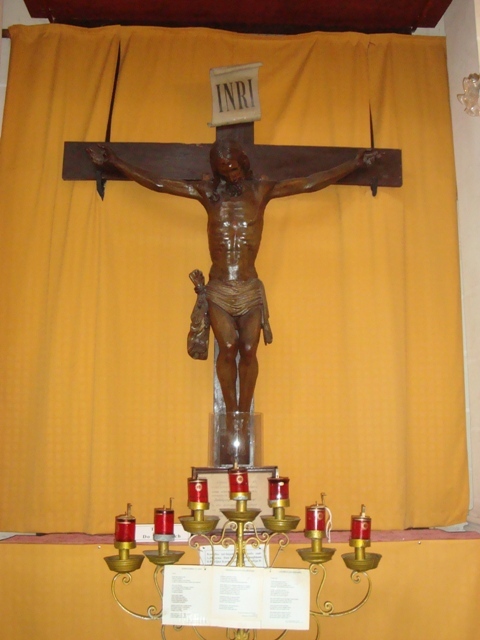 Now, isn’t that a picture of the sort of trust a Christian has in Jesus? He trusts Him through the trials and dangers of life, and he trusts Him to safely bring him home. Jesus, in a much bigger sense trusted His Father to bring Him home safely, from death on a cross to be raised to life, so that He could ascend to His Father and be with Him in His heavenly home. When I look at the road sign, I am reminded of the Heavenly Father, His Son and the Holy Spirit; Three in One. 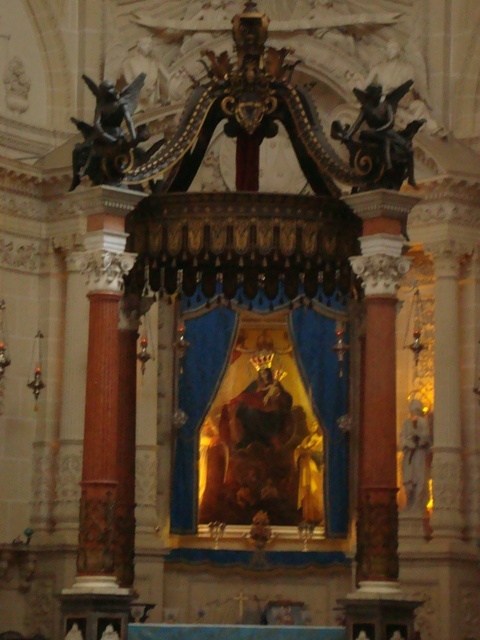 In my mind’s eye I see the Father and the Son wearing crowns of glory, and the Holy Spirit represented by the halo of fire. 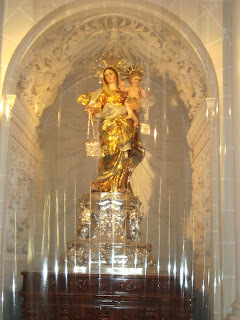 Any visitor to Valetta cannot but fail to be blown away by the splendid Baroque church architecture to be found there. When I qualify the architecture as being ‘splendid’, I refer to the dictionary definition, ‘impressive of beauty or brilliance’, even ‘magnificent’. 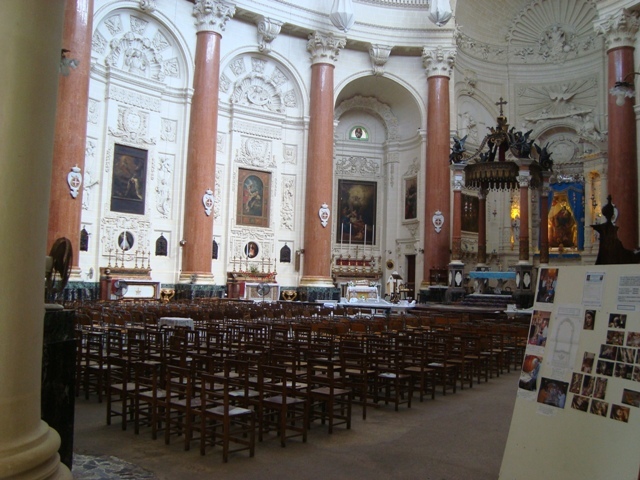 The interior decoration of these buildings is second to none - take the Carmelite Church, for example. The prominent silver dome that dominates the skyline when viewed across the water from Sliema is supported by twelve very tall marble columns that have arched windows above them. Although the building gives the impression of being old, it is in fact, fairly modern, having replaced the original of 1573 that was mostly destroyed during World War Two. I have here photographs I took when I visited the Church while on holiday in Malta. 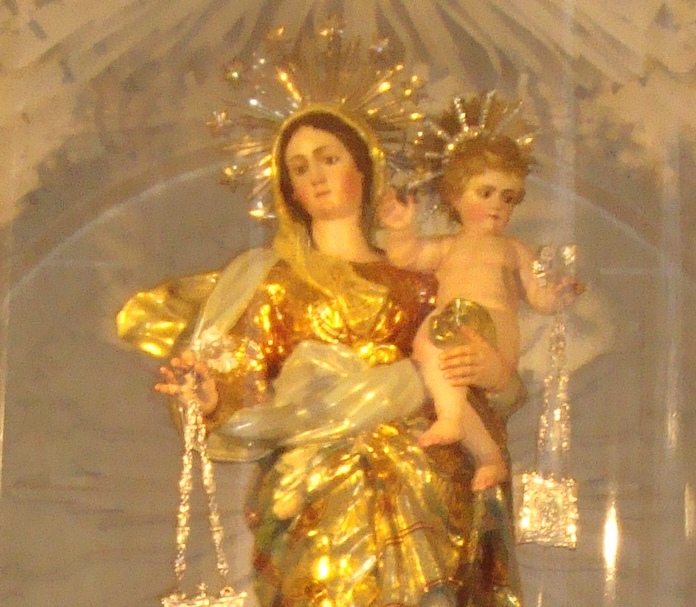 Links below provide more information about this church and ‘The Order of the Brothers of Our Lady of Mount Carmel’, or the ‘Carmelites’. 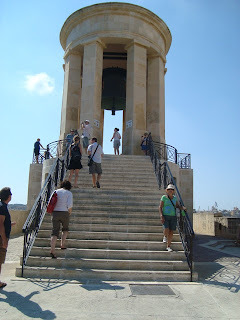 If you are a visitor to Malta you will be reminded of her role in World War Two for the stand made by the inhabitants who experienced a sustained attack by enemy forces between 1940 and 1943. 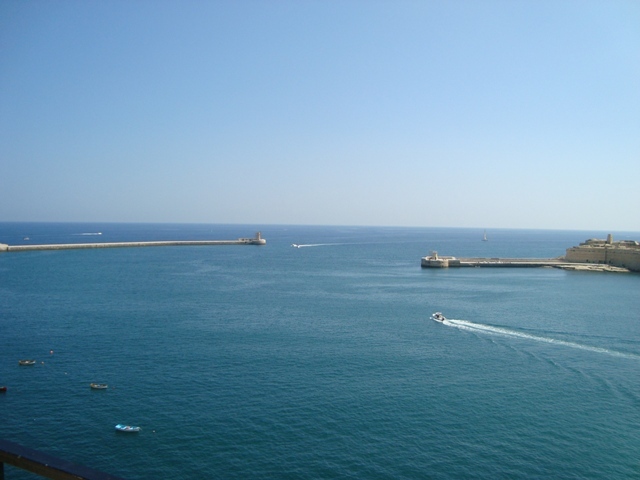 Malta was strategically placed for control of the Mediterranean, since it was sited centrally, providing a staging point for military offensives, particularly upon North African soil. Because of the Island’s strategic importance the German and Italian air forces flew thousands of bombing sorties in an attempt to destroy defences and ports. A great many lives were lost and considerable damage was caused to buildings and the infrastructure. Today there is little physical evidence of that destruction, but on some buildings I observed pock marks that were probably caused by gunfire or shrapnel fragments. 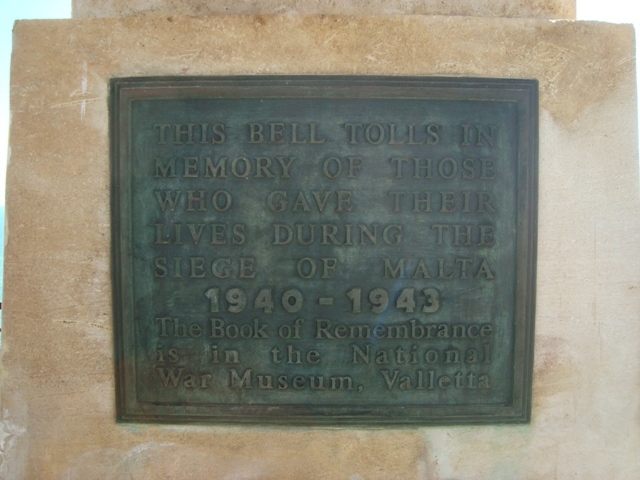 The National War Museum at Fort St. Elmo and the Lascaris War Rooms, both in Valetta have exhibits relating to World War Two. 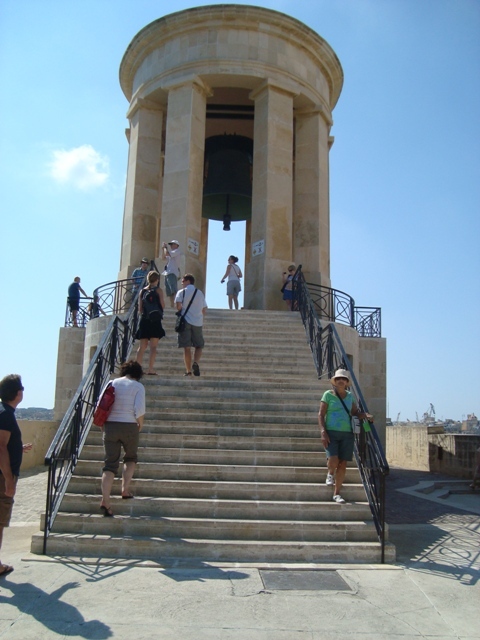 I did not visit either of them, but I paid a visit to the Great Siege Bell which has a prominent position overlooking Grand Harbour. 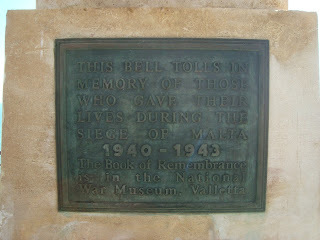 This bell was set up on 29th May, 1992 in remembrance of 7,000 people who lost their lives during the War. 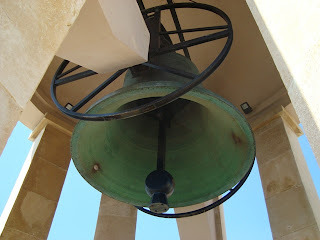 The bell tolls daily at noon.